make an amazing garlic bread! I wasn't sure I'd be able to fit this one in to the schedule this month. Life is so busy these days, our weekends are jam-packed, and hubby and I haven't been crazy about the other breads that have used Parmesan in them. Once the smell came wafting out of the oven, though, I was pretty sure I'd made the right choice! I even made a full-batch for the first time in a long time. Hubby and I (both teachers) haven't brought too many goodies into work yet this year, so I thought it would be fun for each of us to be able to take in half of a loaf to share. The only challenge I had with this recipe was trying to convert my regular (100% hydration) starter to a stiff starter to use for the recipe. For some reason, my math was off, and I only ended up with half as much as I should've had. Luckily, I had a little bit extra of my normal starter, so I just used that to make up the difference. From there on, the recipe proceeded as predicted. I made the stiff starter with bread flour and water and let it sit overnight. It hadn't moved at all when I went to bed, so I was a little nervous, but by the time the twelve hours were up, it had risen nicely. Then I mixed the starter with more bread flour, a tiny bit of instant yeast, salt, water, and olive oil. These mixed in my stand mixer for a few minutes, and then I tried to add the cheese. We decided to use half Parmesan and half Romano, which we sometimes prefer. That didn't work so well in the stand mixer, so I just kneaded it in my hand. The dough handled really beautifully. It rose for two and a half hours, folded half-way through. Then I shaped one oval and one round and let them rise for another hour and a half. Scoring went really well for me this time; I'm so sad that I wasted all of that time trying to master a lame or a knife when the straight-edged razor works so much more easily! Into the oven with a steam pan in place, and they baked for 30 minutes. As always, I checked them early, and, as always, they were already well over 200 F (208 F) and nicely browned, so I pulled them out. We had a very difficult time waiting until they cooled. This bread has a wonderful texture and flavor. Hubby claims that it's the best cheese bread I've ever made, with the exception of the casatiello (no surprise, since that one includes meat!). He loves that there's equal cheesy flavor in every bite. (I did follow most other Mellow Bakers' suggestions to grate all the cheese, rather than leaving some of it as cubes.) The potato, cheddar, and chive torpedoes are still my favorite cheesy bread, but this one is definitely the best Mellow Baker bread of September! Now, on to pretzels, challah, and roasted potato bread. When I read Nicole's post on Pinch My Salt about strawberry freezer jam, I was intrigued, but not convinced. Like Nicole, I assumed that because it was such an easy process, it must be inferior to the "real" stuff. Last Christmas, one of hubby's coworkers gave us a jar. I stuffed it in the freezer and forgot about it. Eh, freezer jam; not the real thing. Fast forward to the middle of this summer, when I stumbled on the jar, realized we didn't have any strawberry jelly in the house, and decided to try it. Oh my goodness, it was so tasty! And when I started making my own yogurt later this summer, we started using a spoonful of jam to sweeten it; by far the best strawberry yogurt ever. We went through the jar in record speed. Luckily another friend dropped off a jar, so we defrosted that one - and lickety split, it was gone, too. So today, I picked up a package of freezer pectin and four pounds of strawberries ~ and in a half hour, we had eight jars of strawberry freezer jam! After the first couple of hours spent on this recipe, I wasn't sure either of us (the cake or me) would make it out intact, and I was positive that I would never make this cake again. Here is the (very long) recap of making the cake layer for Nick Malgieri's Milk Chocolate Mousse Cake, requested by my baby brother for his 27th birthday. 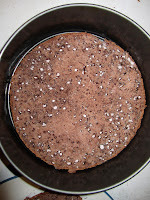 And I was right about not stirring well enough; can you see the specks of flour in the cake? Luckily, no need for a list this time; this was the only thing that went wrong in the second half of my cake preparations. I made the simple syrup: water, sugar, and vanilla, and it cooled while I made the mousse. I've never made mousse before and the process was definitely more involved than most of the cakes I'm accustomed to making. But with the help of my assistant (my hubby), we managed to combine the cream, sugar, eggs, and chocolate without scrambling the egg yolks. The only complication was that some of the chocolate didn't melt when we added the hot egg cream, even with vigorous stirring. So I strained out the bigger chunks and microwaved them for a couple of seconds before stirring them back in. Seemed to work just fine. When the chocolate cream was cooled, I gently combined it with the whipped cream. 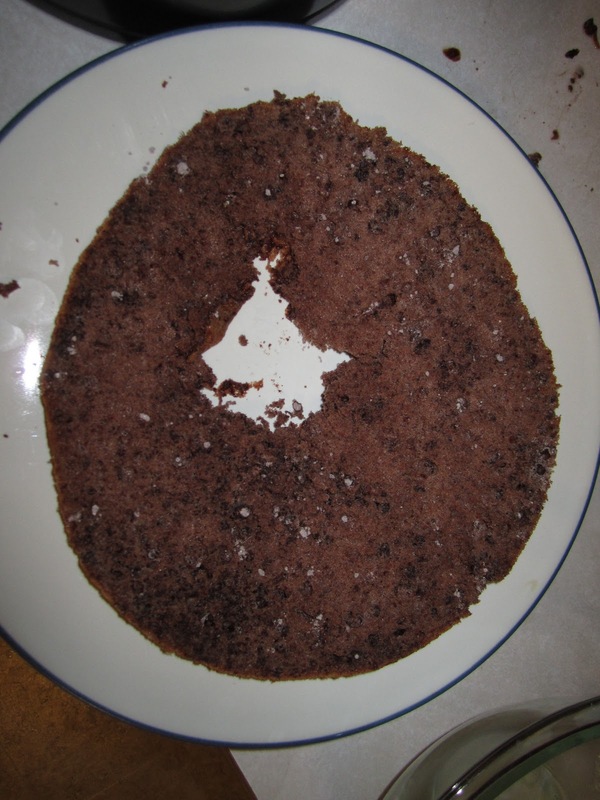 The cake itself was easy to assemble: place one layer on the bottom, drizzle the simple syrup over the top, spread half of the mousse on top, then the next cake layer and the rest of the mousse. Hubby and I "cleaned" the mousse bowl (with our fingers) once the cake was assembled and it was so good. This morning, I unmolded the cake. It seemed to hold together really well, and the kiddos enjoyed licking the inside of the pan (breakfast of champions!). NM tells you to remove the cake from the pan at the very end of the preparations, but I decided to move the cake to my serving platter before finishing it. I am so glad I did, as I think it would've gotten really messy if I'd tried to slide it off the pan after so carefully finishing it with the whipped cream and shaved chocolate. And after all of the drama? Oh YES, I will be making this again. This is by far the best cake I have EVER made in my life!! I may have to do this post in a list form, just to be sure I capture everything that went wrong with this recipe. It was my little brother's birthday last weekend. Tomorrow, we're having everyone over for a birthday dinner. With all of the craziness of the beginning of a new school year, a new school, 176 essays to grade, etc, etc, my mom suggested that we just order pizza and (surprising her) I agreed. But it is his birthday, after all, so I sent him a list of 21 cakes, pies, and tarts from Nick Malgieri's The Modern Baker that I hadn't made yet and was willing to make for his special day. Thrilling the hubby, my mom, and me, he chose Milk Chocolate Mousse Cake. This afternoon, I had about an hour before it was time to make dinner, so I thought I'd get a head start and made the chocolate genoise, which forms the cake layer in the mousse cake. I got all of my ingredients and supplies out and then whisked together the dry ingredients. I am not an inexperienced cake baker, but this was definitely the most complicated cake I'd ever baked. I whisked together the eggs, egg yolks, salt, and vanilla, and then added the sugar in a stream. I had started a pot of water boiling, so I put my bowl on top and continued to whisk the egg mixture gently until the temperature registered 115 F. Then I attached my bowl to my stand mixer and let the whisk attachment whip the eggs for several minutes, until they had increased in size and lightened in color. 1. I started to prepare my pan. NM calls for a 9 inch springform. My pans seem to be off in size (I've had this problem before); the littlest one measures 8 1/2 inches, while the next size up measures 9 1/2 inches. I said to hubby, "Hm, that's odd. The regular genoise calls for 1/2 cup flour and 1/4 cup corn starch, but the cocoa genoise calls for 1 cup flour, 1/3 cup corn starch, and 1/4 cup cocoa. It seems like so much more dry stuff without any other changes to the recipe." Hubby agreed and said, "Well, use your bigger pan." But then I said, "But I'm going to have to cut it in thirds, so . . ." and we decided to go with the smaller pan, figuring it would bake up taller. I was a little concerned, though, because my smaller pan seems to be slightly bent out of shape. And on we go. 2. Once the eggs were frothy, I started to sift and fold in the dry ingredients. I could tell it wasn't working. There was so much dry stuff, it just wouldn't incorporate into the eggs. I kept folding and folding, and I could tell that the eggs were breaking up and the batter was breaking down. Sure enough, when I went to pour it into the pan, there was barely anything left. But I stuck it in the oven anyway. 3. Only a minute later, I could smell smoke from the oven. And the slightly-dented springform was leaking. The smoke alarm didn't go off until the cake was about finished baking, though, so that was a plus. "Am I really that bad of a baker?!" I wondered. So I opened my computer and searched for "modern baker milk chocolate mousse errata" and found this helpful post. There's an error in the recipe. It's supposed to read 1/3 cup flour, 1/3 cup cornstarch, 1/4 cup dutch-processed cocoa. "Well," hubby said, "just bake it again." Which is when the meltdown started. Because (here comes another list): #1, I had used up all of my dutch-processed cocoa; #2, the only place to get dutch-processed cocoa is a good 15 minutes away; #3, I had used up all of my cornstarch; #4, the bottom of the oven needed to be scrubbed and #5, the oven was still hot; #6, I had to do all of the dishes from the first time around in order to use them again; #7, we had two hungry, crabby kids running around and #8, it was time to make dinner; #9, I'd re-read the recipe for the mousse cake which said that it needed to be made a day ahead, which meant the cake needed to be made early enough to cool with enough time left in the evening to finish the recipe, and #10, I'd already made the cake!!! Hubby put in a movie for the kids and ran out to get the cocoa and the cornstarch. I finished the batch of granola I'd been in the middle of baking, did all of the dishes, scrubbed the oven floor, and made a quick tuna salad. When he got home, I quickly ate and then left the table to start making cake part two (being thankful, for the millionth time, that our kitchen is open to our dining room, so I could still visit with everyone while I baked). 5. I whisked together the dry ingredients again. And then realized that I'd used all of the same measuring cups, which meant that I'd again used 1 cup of flour. So I threw it all out and mixed it again, this time using the correct amounts. 6. I whisked the eggs and sugar, and then heated them gently. (Anyone see the problem?) Once the eggs were whirring in the stand mixer, I realized that I'd forgotten to add the salt and the vanilla, so I stopped the mixer, added them both, started the mixer, and crossed my fingers. I let the mixer go a little longer to get the correct volume and color. 7. Then came time to fold in the dry ingredients. I was so concerned about the eggs breaking up again that I folded oh so gently. And when I went to pour the stuff in to the prepared pan, huge chunks of flour were still in the batter. So I folded again in the pan. 8. Into the oven. I was smart this time and put a small sheet pan on the shelf under the springform for the first 10 minutes to catch the drippings from the dented pan. There were quite a few. I was so nervous. I warned hubby that it wouldn't be pretty if this one didn't turn out, but this time the cake clearly rose. I removed it from the pan immediately (although it really wanted to stick). Looking at the final product, I'm not sure it's thick enough to slice into three layers, but it looks to be a similar height to the picture in the book. Of course mine is not nearly so pretty as the one in the book and I'm very glad it's going to get covered up with other stuff. I'll let you know how the rest turns out tomorrow. Fingers-crossed that it's a less exciting undertaking. I missed my blogiversary (it was in early September), but I'm ready to celebrate post #100! Unfortunately it arrives at a time when I am so swamped with work and life that I don't have time to do it justice. So here I am, blogging about a bread I baked a week ago with only one (badly-lit) picture. When I went to bake this bread, I discovered that I'd neglected my starter Austin, so I began by refreshing him a few times. Then I made the sourdough by combining rye flour, water, and a bit of Austin. I let it rest overnight, and I was happy to find that it did show signs of development after about 14 hours. Then I mixed in the rest of the ingredients: bread flour, rye flour, water, salt, a hint of instant yeast. The dough was really wet and, because I'd only made half of the recipe, my dough hook couldn't seem to do anything with it. I took it out and did a couple of stretch-and-folds. Finally I gently kneaded in the walnuts. The dough took a while to double - probably about an hour and a half, and then I shaped it into two mini loaves so that we could have one with dinner and still have one to take in to work for the first day of school. I baked them (steamed, too) for . . . okay, I actually can't remember. Maybe 15 or 20 minutes? This bread was yummy, although the kids didn't like it (they're fussy about nuts in their bread). I loved the combination of light rye with the walnuts. It was quite popular at school, too! Other Mellow Bakers' September breads can be found here! I started at my new school this past Monday. I imagine that with the move back to full-time teaching, extra-curricular coaching, and my desire to spend any free time with my family, my baking and blogging will both be slowing way down. But we had our back-to-school staff lunch yesterday, and I just couldn't imagine making anything but bread. I needed something simple. We were at school for freshman orientation until late Thursday night and we had an early morning meeting on Friday. And I needed sleep. So I opened up Peter Reinhart's Artisan Breads Every Day and stumbled on to the recipe for soft cheese and onion bread. This seemed to be a quicker version of the potato, cheddar, chive torpedo, which was one of my absolute favorite breads from the BBA. When I got home on Thursday night, I quickly mixed up the dough. It proofed in the fridge overnight. I woke up early on Friday and decided to go with one of P.R. 's variations. I rolled out the dough the same way I do for cinnamon buns, but with chunks of cheese inside. I made three-quarters of a recipe, which gave me a 9x13 pan plus three extra cheese buns. These were a huge hit at work. I didn't think they were nearly as good as the potato, cheddar, chive torpedoes. I thought the texture wasn't as soft, maybe because I didn't use potato water or milk to tenderize the bread, and I didn't find them as flavorful. While the kiddos liked the torpedoes, they wouldn't eat these. But hubby thought they were even better than the torpedoes, so clearly this is a make-again recipe. 1. In a mixing bowl, whisk the flour, salt, sugar, and buttermilk powder. Separately, combine the water and the beer. (I used extra-hot water to help warm up the beer.) Then whisk in the yeast until disolved. Pour the mixture and the melted butter into the dry ingredients. 2. Mix using the paddle attachment and the lowest speed for a minute or two. Let the dough rest for five minutes. 3. Switch to the dough hook and mix for three minutes (I used speed 2). 4. Add the onions and knead by hand for a minute or two until they are incorporated. 5. Put the dough into an oiled bowl, cover it with plastic wrap, and stick it in the fridge overnight. 6. By morning, the dough should have doubled. Transfer the dough to a lightly floured and oiled surface. Roll it out into a 12x12 square. Sprinkle the cubed cheese over the top and then roll it out into a log. Rock the log back and forth on the counter to extend it slightly and to get out some of the air pockets. 7. Cut the dough into 1 1/2 inch pieces (I use flavorless dental floss to cut through the dough) and place them in a parchment lined, greased pan. Cover with plastic wrap and allow to rise for 1 1/2 - 2 hours. 8. Bake for 20 minutes at 350F, turning the pans after 10 minutes. 9. Cool on a wire rack for at least 15 minutes. I really wanted to love this recipe. It was so easy to make: mix bread flour, water, eggs, butter, sugar, powdered milk, salt, and instant yeast. Then let the dough double. Shape the rolls (I made half of the recipe into knotted hamburger buns and the other half into cloverleaf rolls). Let them rise until they're soft to the touch. Brush them with butter. Bake them. The dough handled beautifully. It did everything it was supposed to do when it was supposed to do it and was a dream to shape. I checked the rolls a couple of minutes before they were supposed to be done, and they were already way above 200F and almost too dark brown on the bottom. And . . . we didn't love them. Hubby had one of the knotted rolls with his hamburger and the kids and I each had a few bites of the cloverleaf rolls. And that was it; we didn't eat any more. I think we'll stick with our standard: white bread buns from the BBA or ABED, which disappear off the cooling racks before the burgers are even finished cooking. Here are the other Mellow Bakers' September breads!